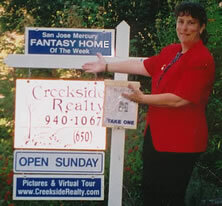 Cynthia Haines has been a broker/owner of Creekside Realty West since 1988. – She established a unique philosophy she established from the beginning – educate the client and help guide them to their decisions. Real Estate is as much about service as it is sales. She earned an A.A. in Business Administration from De Anza College and B.S. Business Management from St. Mary’s College, Moraga and uses this business education along with 10+ years working in Silicon Valley hi-tech industry to relate and better serve the local clientele who are looking for something above and beyond the typical real estate experience. She believes in personal service and oversees every transaction. She exemplifies care, integrity, energy and thoughtful creativity with every real estate transaction working proactively to head off any potential problems. She has never met a project yet she didn’t love – fixing up and getting homes ready for sale is a real specialty for her and her team of contractors and stagers. The majority of her business comes from past clients and referrals which takes her in a large geographic area from San Mateo to San Jose and beyond to Santa Cruz County, going where the client needs to go. She has spanned generations in the 27+ years of business – selling now to the children of her original clients. Her expertise covers nearly every area of real estate. Besides assisting buyers and sellers in residential sales, she manages long-term property rentals as well as short-term vacation rentals in Santa Cruz County and Hawaii. She is also actively involved and very knowledgeable in HOA management through 20+ years of personal volunteering and experience. Cynthia loves to travel, especially with her husband and two children and is actively involved in volunteering and fostering for Northern California Beagle Rescue. © Creekside Realty West. All rights reserved. Site developed and hosted by Rogue Web Works, LLC.